The Raspberry Pi was a groundbreaking device as it showed users what could be possible with a $35 development board. In the years since, we have seen plenty Raspberry Pi alternatives arrive in the market. 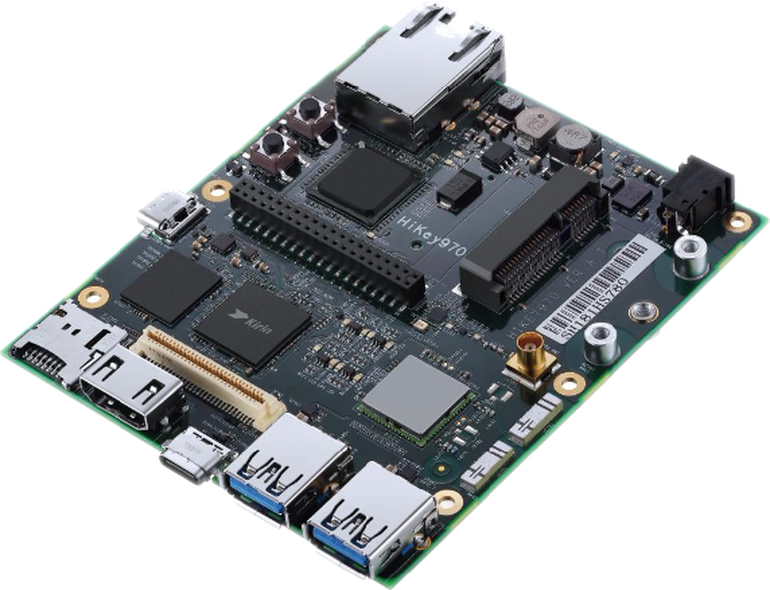 Huawei and Linaro launched the HiKey 960 development board last year at a price tag of $239. The board featured the HiSilicon Kirin 960 system-on-chip, and was positioned as a high-end alternative to the Raspberry Pi. Now, Huawei and Linaro have launched the HiKey 970 development board at the Linaro Developer Conference. The board looks like the Raspberry Pi, but it is significantly more powerful. This is because it’s based on the HiSilicon Kirin 970 system-on-chip, which features four ARM Cortex-A73 cores clocked at 2.36GHz and four ARM Cortex-A53 cores clocked at 1.8GHz, paired with the Mali-G72MP12 GPU. The Kirin 970 has dedicated hardware for AI in the form of a Neural Processing Unit. The HiKey 970 board has 6GB of RAM along with a microSD slot. It supports 4K displays via HDMI 2.0a, has 2 USB 3.0 and 2 USB Type-C ports, and runs Ubuntu, Debian, and Android. The development board is designed for creating apps, particularly on Android apps. It uses the same chip as the Huawei Mate 10 / Mate 10 Pro, and the Honor View 10, meaning that its performance is on par with a high-end Android smartphone. It also comes with Huawei’s HiAI SDK. The HiKey 970 thus comes with higher computing power, and it also supports AI stacks. Its energy efficiency is said to be up to 50 times more than that of CPU operations, while performance is up to 25 times more. It has heterogeneous resource management, and its dedicated NPU can enable developers to develop deep learning algorithms, smart robots, automobile software and smart cities. The board will be open to developers for sale in mid-April. Its price hasn’t been revealed yet, but it’s fair to expect it be on par with the HiKey 960’s $239 price tag, on account of its high-end specifications.